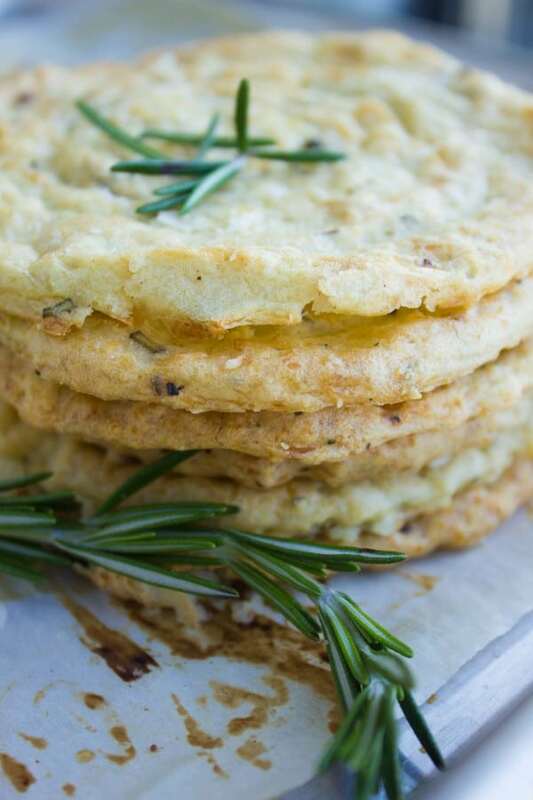 If life gives you leftover mashed potatoes, make these Mashed Potato Rosemary Crisps! Being gluten-free and paleo, they make for the perfect crowd-pleasing accompaniment for a classic Sunday Roast – but these also taste delicious as a little savory snack! Season them with any herbs or cheese you want. 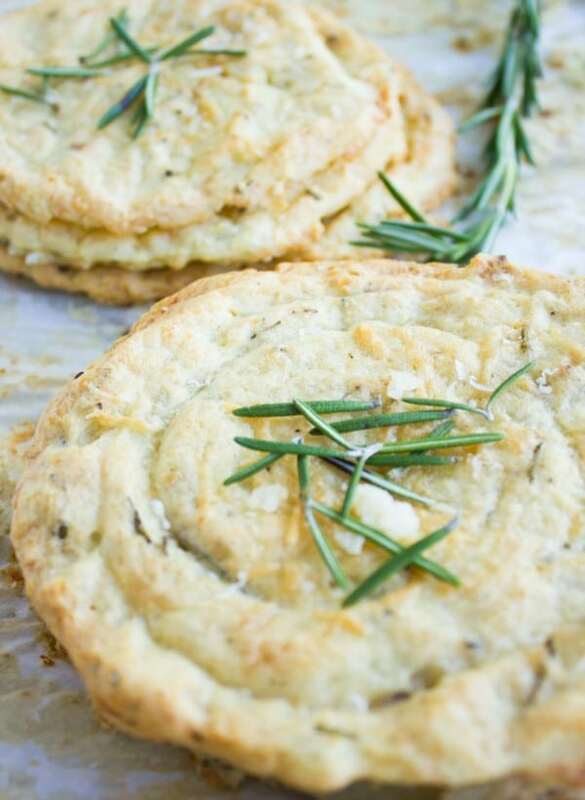 This mashed potato rosemary crisps recipe is a perfect side to any comfort food meal and one of the best ways to use up leftover mashed potatoes! These are like potato chips but with a delicate crunchy outside and a soft tender inside, flavored with fresh rosemary and Parmesan cheese. A few years ago, I planned a cooking class for a comfort food menu. It was one of those cold cold winters where everyone was saying they just wanted to stay indoors and have soup everyday and these mashed potato rosemary crisps were one of the first recipes that came to my mind. Guys, this recipe is ridiculously easy and totally customizable. 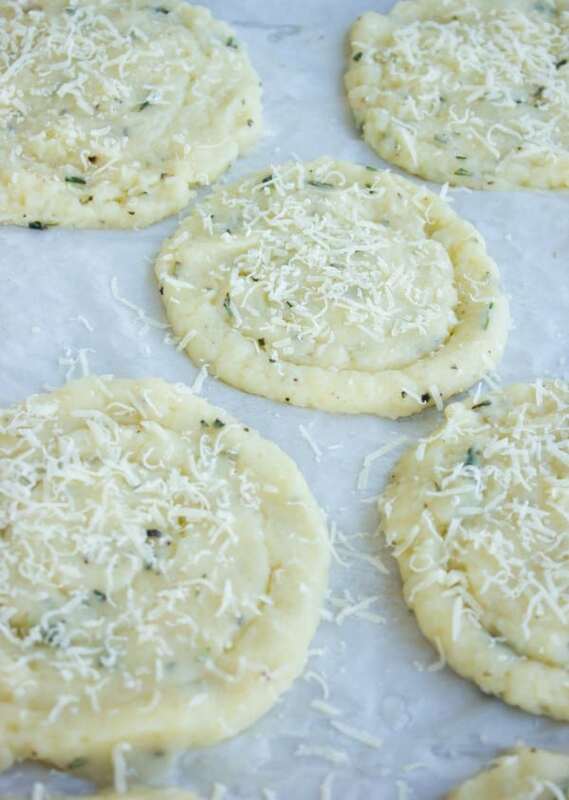 The base for these mashed potato crisps is leftover mashed potatoes, and you can season these with any herbs, cheeses and spices you like. Think garlic, scallions, green peas or any finely grated veggie. Also, it does not matter whether you prefer your mashed potatoes with cream, milk or butter —everything works in this easy recipe! The only unusual addition to your mashed potato is 1 egg. It’s that simple. 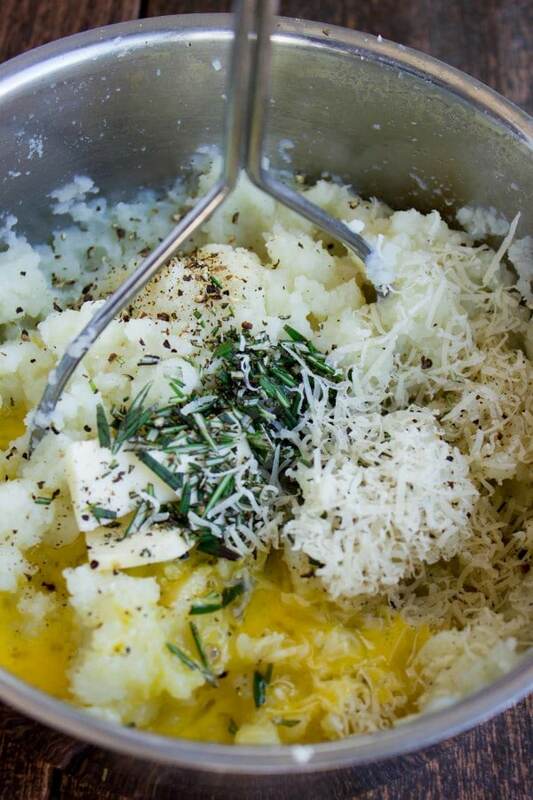 While I do like to add some grated Parmesan and fresh herbs, you can go with any seasoning that appeals to you just as long as you make your mashed potatoes somewhat on the dry side. Preheat the oven to 400 degrees F. Mash the boiled potatoes with salt, pepper, butter and cream (or milk) until smooth (or leave it chunky if you prefer). Then add in the fresh rosemary, egg and cheese and mix them in. Once you got your mashed potatoes ready, stir in the egg, mix well, and place the mixture in a piping bag (or a ziplock bag, and cut a bit off one of its corners) and start piping rounds of mashed potatoes onto a parchment-lined baking sheet. The size, shape and thickness of the potato rounds are completely up to you—from thin and flat to thick and high, big or small, rounds or rectangles or any shape will work. 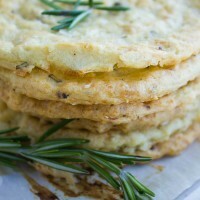 And there you go – crispy golden mashed potato rosemary crisps with a soft center that almost melts in your mouth. The beauty of a simple side like this is that it’s completely gluten free and paleo friendly too. If you don’t like the taste of eggs in your food, you’ll want to add the grated parmesan cheese and fresh herbs to completely mask that flavor. You can kick up the spice level and really make these more like an Indian style potato and veggie crisp, or add garlic, scallions, baby spinach and feta cheese for a Greek feel..the possibilities are endless! Keep your mashed potatoes on the starchy and dry side. That way, they will hold their shape better. 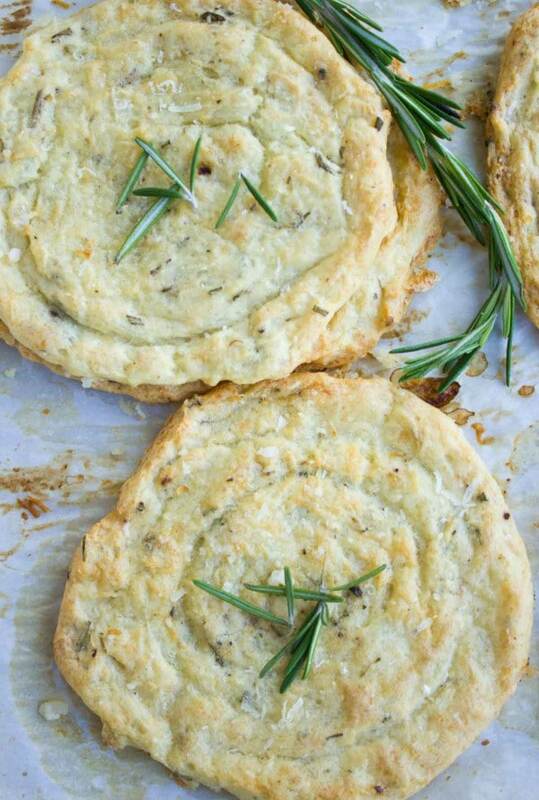 If life gives you leftover mashed potatoes, make these Mashed Potato Rosemary Crisps! Being gluten-free and paleo, they make for the perfect crowd-pleasing accompaniment for a classic Sunday Roast - but these also taste delicious as a little savory snack! Season them with any herbs or cheeses you want. Mash the boiled potatoes with salt, pepper, butter and cream (or milk) until smooth (or leave it chunky if you prefer). Then add in the fresh rosemary, egg and cheese and mix them in. 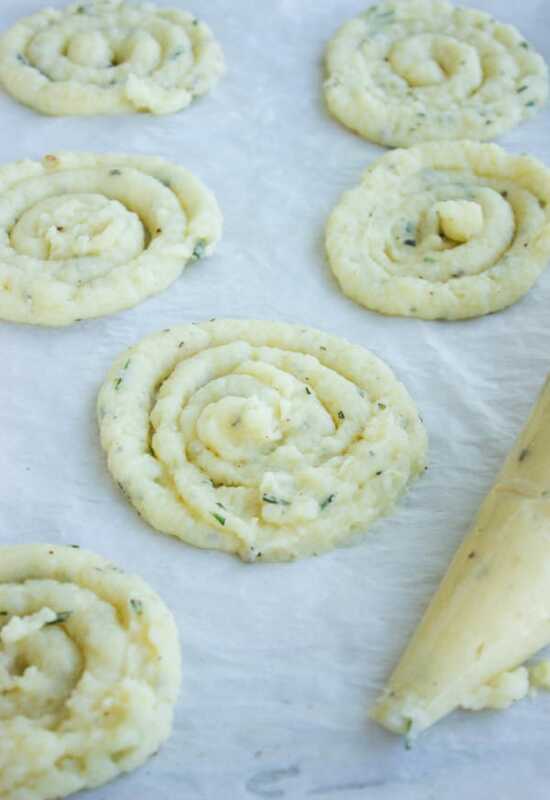 Put the mashed potato mixture into a piping bag and pipe rounds of potatoes on a parchment-lined baking sheet. The size, shape and height (thickness) of the potato round is completely up to you—from thin and flat to thick and high, big or small, rounds or rectangles or any shape will work. If you don't like the taste of eggs in your food, you’ll want to add the grated parmesan cheese and fresh herbs to completely mask that flavor. Thanks:) Hope you make it soon. I love mashed potatoes, and this recipe looks different and delicious. I love rosemary and it sounds like a delicious combination!